Some can swim away. Some try to crawl away. Others might propulse away. Many are just too slow or stuck. Dead zones of low oxygen-water kill crabs, fishes and other marine life. And the recent annual occurrence of dead zones in the nearshore points to dramatic changes in our ocean environment. Today we’re just 2 miles off the Oregon coast monitoring ocean conditions - It’s hard to imagine but this vast body of water under us may not have enough oxygen to support marine life. Prior to 2002, dead zones, which are areas suffering from lack of oxygen - also called hypoxia were not reported in the nearshore waters of Oregon or Washington. But since 2002, hypoxia has occurred here each summer, to varying degrees. How does a dead zone form? Each spring, our coast is dominated by winds that blow from the north to the south. This wind is the engine behind ocean currents that move cold water up from the deep ocean to the coast. The upwelled water is naturally low in oxygen. This upwelling can be seen from space as a band of cold water that forms along the coast. Upwelling currents also bring nutrients to the surface of the ocean where they fuel the growth of microscopic plants called phytoplankton. Phytoplankton bloom and fuel a productive food web in the upper ocean. The phytoplankton eventually sink toward the seafloor where they decompose using up oxygen in a layer of water that has less oxygen to begin with. This combination can give us dead zones that can envelope much of the coastal ocean. When northerly winds are stronger and steadier than usual and the upwelled waters have lower oxygen to begin with, dead zones can go from low to no oxygen. This is something that we observed for the first time in 2006. 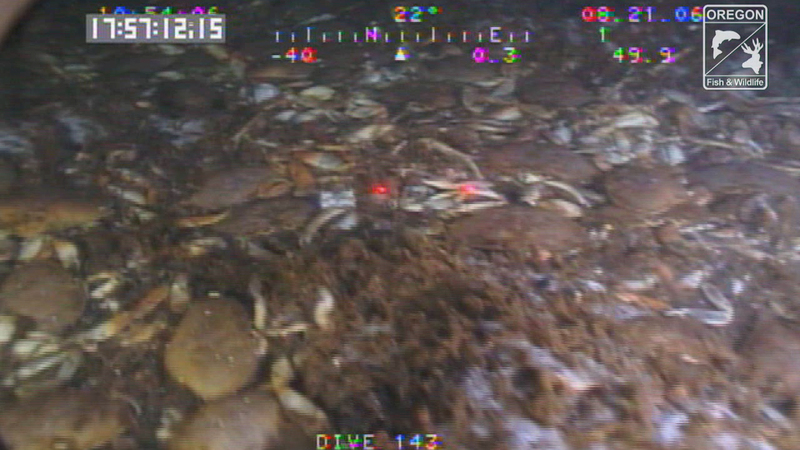 This footage was taken at the same reef during a hypoxic event. There are no fishes on the reef because they have moved away to find oxygen. The slower moving animals cannot leave and suffocate: the dead zone leaves a changed ecosystem behind. The changes we are seeing are challenging us to find new ways and to forge new partnerships to study and monitor our coastal oceans. We are now deploying sophisticated new buoys and ocean-roaming robotic gliders that provide data on ocean conditions in near real-time to the public. We’re learning that coastal dead zones can be triggered by large-scale changes in how the open ocean and atmosphere operate. Both ocean currents and winds are shifting with changing climate. Understanding these alterations and their causes helps us to assess the impact of climate change on coastal oceans and the abundant life they contain.